Show off the crazy side of your personality and invest in an awesome crazy Halloween costume. Here at bodyjewelleryshop.com we have everything you need to make Halloween that little bit more interesting. Choose an awesome Halloween costume to impress all your friends and finish it with some of our fantastic Halloween accessories and Halloween contact lenses. You can easily make your Halloween costume look that much better than everyone else’s so with three weeks to go it is well worth getting your costume sorted now. Freak everyone out and make your Halloween one to remember. This bright orange jumpsuit makes you look like you have just escaped from a high security psychiatric ward. The jumpsuit has Psycho Ward printed on the front and the reverse has Psycho Ward Committed, just incase people didn’t know. 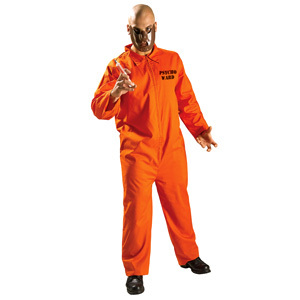 This bright orange costume comes complete with the mask similar to that worn by Anthony Hopkins character in the 1991 movie in The Silence Of The Lambs. The mask covers the lower half of your face with a barred detailing over your mouth allowing you to breath easily but enhancing your crazy look effortlessly. Declare yourself dangerous and insane and creep out all your friends this Halloween. Team your costume with some freaky psycho killer contact lenses like the ones below and get everyone commenting on how awesome your costume looks. The bloodshot contact lenses are perfect for that crazed look in your eye. They have a bright white background and are detailed with veins of red detailing to give a gross bloodshot effect. They will make your eyes stand out and get noticed while complimenting your psycho costume wonderfully. If you want to go one better on the Halloween costume stakes, and look a little more dangerous and deranged then we recommend you try this Skitzo fancy dress outfit. It has the traditional bright orange jumpsuit with a barcode printed on the top left. The costume also consists of a vinyl belt with attached shackles and chains, which enhances the idea of dangerously crazy. To finish off the costume you also get the truly creepy looking face mask. This attaches over the lower part of your face as if to put your mouth in a cage. You will definitely freak out all your friends with this awesome Skitzo costume. All you need to do is put on your best psycho impression and your set for any Halloween party. To give this costume an even freakier edge team it with a pair of bright white contact lenses like the ones below and enjoy scaring your friends even more than usual. This entry was posted in Contact Lenses, Fancy Dress and tagged colour contact lenses, Coloured Contact Lens, Coloured Contact Lenses, Coloured Contacts, Coloured Lenses, Contact Lens, contact lenses, Costume Contact Lenses, Crazy Contact Lenses, Halloween contact lens, halloween contact lenses, Halloween Costume, Halloween Costume Ideas, halloween costumes on October 8, 2011 by Piercing Guru.